LONDON - Contemporary Indian master F.N.Souza's 1957 painting, estimated between $1.7 million to $2.5 million, is leading at the Modern and Contemporary South Asian art sale at Christie's slated for June 11, the organizers said June 4. The painting "Man & Woman Grinding Their Teeth" borrows from traditional African art and cubism with both figures painted with mask-like faces and elongated features. Ever since he tamed a cheetah in Bahrain last year, an animal trainer from India has become a much sought-after name in the Gulf countries for taming wild beasts. “Ashes were found in a green marble box (manjusha) kept in a box of stone from Sarnath Stupa during the digging carried out by Jagat Singh, diwan of Raja Chaitsingh of Benaras in 1798. It is believed that the ashes were immersed in river Ganga and manjusha was handed over to a museum in Kolkata,” the eastern region of Archaeological Survey of India said. 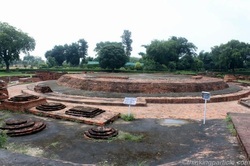 Meanwhile, between 1958 and 1981, K P Jaiswal Institute in Patna started an excavation around the Stupa in Vaishali of Bihar under the supervision of A S Altekar, wherein they found another manjusha with remains of Lord Buddha, which is now kept in the Patna museum. During the British Raj, in the West-North part of Nagarjunakonda Buddh Mahachait, a coolie found a small broken pot containing the remains which were confirmed of Lord Buddha after examinations. A century-old shady tree, planted by British settlers at a famous park in Udhagamandalam during the colonial period, was uprooted in heavy winds and rains. According to local historians, the 123-year-old tree, named as Rhopalia Crelata Myrtaceae in scientific parlance, was planted at the famed Sims Park at nearby Coonoor in 1890 by some colonial botanical enthusiasts. The 150-feet tall tree was brought from Australia and planted by the Britishers in 1890 and was one of the 160 saplings planted from as many countries during different period in the Park, horticultural department sources said. According to Park authorities, a few branches of the tree had fallen during the last seasonal rain but it was being maintained properly. There could have been casualties had the tree fallen during the day time when the park is thronged by tourists in large numbers, park sources added.